If there is a difference in temperature between two areas heat will always transfer from the warmer area to the cooler area. Heat transfers in three ways: Conduction, Convection and Radiation. Radiation: Heat you feel from a heat source such as the sun, fire or furnace. Radiation does not rely upon any contact between the heat source and the heated object like conduction and convection. Heat is transmitted through space by thermal radiation also called infrared radiation. Conduction: Transfer of heat through direct contact through the roof, walls, windows or other material. Heat conducts from the hot side toward the cold side. The better the conductor, the more rapidly heat will be transferred. CIC is a very poor conductor and this blocks conduction. Convection: Transfer of heat through the circulation of air. Hot air rises, cooler air sinks. The sun radiates heat to the roof and walls of the house. Heat conducts through the roof heating up the attic space. Walls and ceilings conduct heat and radiate it throughout the building. Convection makes the warm air rise and the cool air sink. Heat will travel to cooler areas as is the case in winter when the heat from the furnace conducts to the outside. The following image demonstrates how CIC addresses these forms of heat transfer. 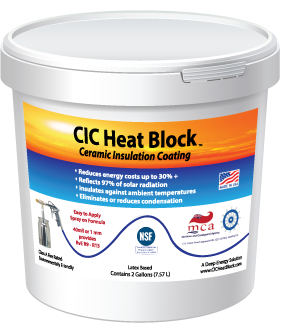 CIC Heat Block can be applied to the outside of the roofs and walls especially on a surface that is exposed to solar heat loading from direct sun. 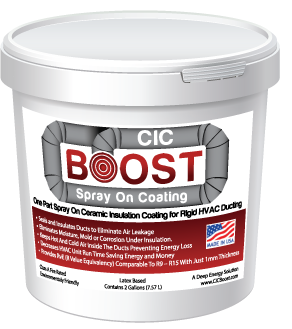 CIC can also be applied to the inside of a wall or ceiling or both inside and outside. Radiation: The radiant heat from the sun is reflected off CIC reducing solar heat loading on roofs and walls. In an interior application, the radiant heat from the furnace is retained inside the building. Conduction: The tightly bound ceramic particles and very thin air gaps in each application layer of CIC dramatically slow conductive heat transfer. Keeping the heat outside in the summer and inside during the winter. Convection: CIC uses convection to keep warm air circulating inside the building in the winter and the cool air circulating in the summer which keeps the building more comfortable. Many HVAC systems are located outside, this example it is installed on a roof top and is subject to full sun and solar heat loading. Radiation causes heat from the sun to warm the surface of the ducting. Conduction is the movement of heat through the walls of the ducting which causes air in the duct to warm up. Convection within the duct circulates the heat within the duct. The following image shows the results of coating the ducting with 40 mils of CIC Boost. Radiation: CIC Boost reflects 97% of the suns radiation reducing solar heat loading on the ducting. Conduction: the tightly bound ceramic particles and very thin air gaps in each application layer of CIC dramatically slow conductive heat transfer. This results in cooler air, reduced run time of the unit and saves energy and money. Radiation and Conduction have a major heating effect on a metal container. This effects not only comfort but the condition of the product being stored or transported. Radiation Heat you feel from a heat source such as the sun, fire or furnace. Sun radiates heat to the roof and walls of the container. Conduction: Transfer of heat through direct contact through the container roof and walls. Heat conducts from the hot side toward the cold side. This heat is conducted inside the container heating the interior space and the cargo. A 40 mil application of CIC Rhinoskin. This can be applied exterior, interior or both. 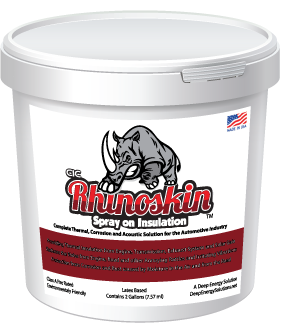 CIC Rhinoskin reflects 97% of the radiation dramatically slows conduction resulting in a cool interior that keeps the cargo fresh. CIC Rhinoskin is great for cargo trucks, containers, metal storage units, container housing, container offices and more.